Artist Reflection: On black spatial matters. Eyebeam Resident Torkwase Dyson talking about the work she was doing whilst in residence in 2015-16. A year ago, I made a mobile studio enabling me to move around the United States to study the history of spaces as they pertain to black women’s struggles, on, in and during site. 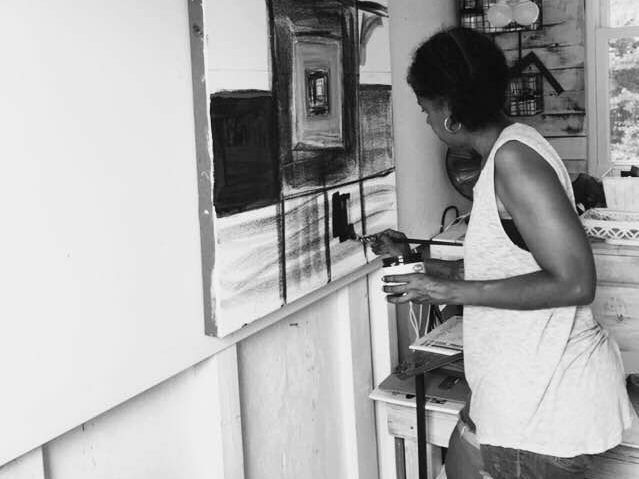 The studio is also a physical space to make things: drawings, paintings, and conversations. It was a way to journey in between spaces, trying to map out and collect all of these histories with my own. The idea was to create a comfortable space, where I could make drawings and maps, think about cartography, geography, about my own making, which people would feel welcome to come into and to revisit. I equipped this small studio with chairs, benches, shelves, and a solar array that powers small media devices. 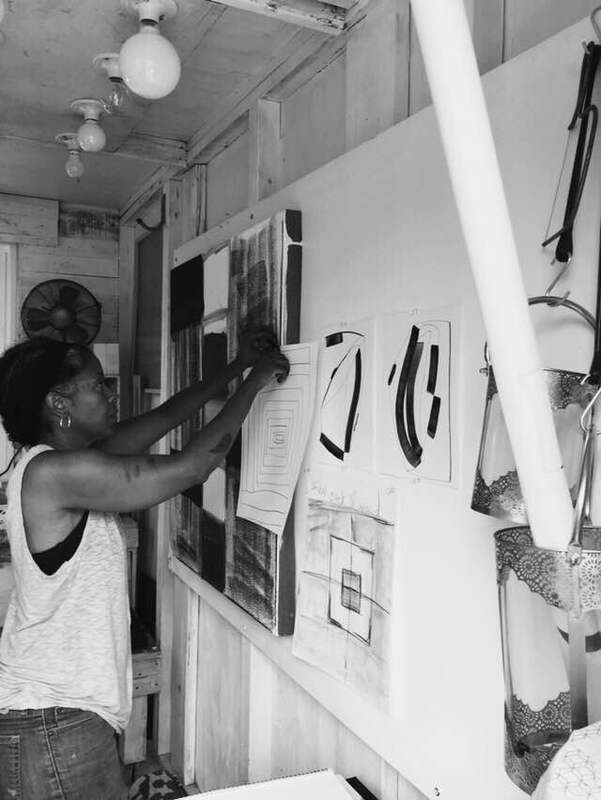 Living in Mississippi—I’m from Chicago but consider myself very much influenced by the South—it dawned on me that I could propose ideas about my own ancestral history with the technology and the skills that I had learned through architectural design. So, I dove into the ideas of lynching. The way that I came to understand that practice, and culture, was through the work of the journalist Ida B. Wells and my own experience in Mississippi, as well as a number of different texts on the phenomenological experience of lynching. What really haunted me was the memory of being six or seven when I learned about my ancestor’s material experiences. Through the imaging of lynching culture, I had a rooted fear of what it meant to experience a photograph of my own history and that of my ancestors—images of lynching culture. The combination of architecture, my experiences in Mississippi, and painting practice, led me to think about ways to propose this history of my ancestorship in the language of lynching. I decided to make paintings and drawings that reconfigured that history of murders and tortures in a way that was diametrically opposed to images in photography. And I did this so that I would unkeep that history. Unkeeping is a way to superimpose the form in which those images have been circulated. The way in which we think about those singular, or multiple bodies in those different geographic sites. Each circle in these paintings is a symbol of a tree. As I make these marks, I am acutely aware that I am reorganizing my own relationship to photographic culture—to data visualization. It was through all of these ways of building and knowing, through architecture and sculpture, that I found a way to challenge the way in which black experiences, landscapes and bodies have been represented. The way in which I had experienced those things. I use these languages that I’ve found, later on in life, to unkeep the way in which my ancestral practices have been settled through photography, films and literature. Unkeeping lets me problematize my own experience, and create systems to understand how I embody history, making and materiality. This article is an edited transcript of a talk (full recording with architect Mario Gooden and philosopher Tony Bogues) and part of Dyson’s exhibition Unkeeping. Learn more about her work or see her time in Mebane, North Carolina on @eyebeamnyc‘s Instagram. 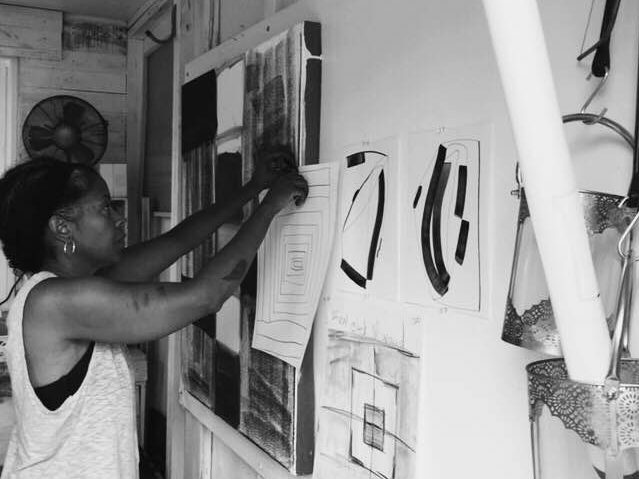 Currently traveling through North Carolina and Mississippi with her mobile studio for the project In Conditions of Fresh Water, Torkwase Dyson is a Research Resident at Eyebeam.